An increase in pay for construction workers could be among the drivers that will push the construction cost of the new National Children’s Hospital beyond €1.4bn. It comes as it was confirmed its controversial two-stage procurement process – which was blamed for contributing to the escalating cost of the project – will not be repeated when the tender for the new National Maternity Hospital is issued. The cost of the hospital, to be sited at the St Vincent’s hospital campus in Dublin, has currently been set at a provisional €300m. But it is only when construction companies respond to the tender that a clearer figure will emerge. 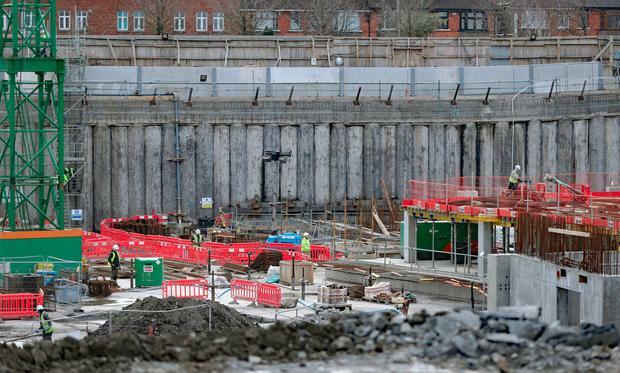 The two-phase procurement involving the underground and overground work at the children’s hospital is being abandoned for the next major hospital build. The process was strongly defended by the National Paediatric Hospital Development Board, which said it helped speed up the construction. Asked what form the maternity hospital construction will take, a HSE spokeswoman said: “It will be a traditional procurement process. Planning permission for the new National Maternity Hospital is in place and a contractor was appointed for work on the pharmacy and car park. The work on the main project will start once site preparation has been completed. The process for the children’s hospital saw the construction cost rise from €983m in April 2017 to €1.4bn in November last year – and the final bill could rise even higher. The Government will be anxious to avoid another spiral in cost as seen in the national children’s hospital. Health Minister Simon Harris told Fianna Fáil TD Michael McGrath that the additional costs could be triggered by scope changes and construction inflation above 4pc from July. He also cited as a “potential risk” the industry-wide Sectoral Employment Order, introduced in 2017. This refers to the revised statutory minimum pay, pension and sick pay entitlements for craftsmen, construction operatives and apprentices employed in the construction industry. It gave legal effect to the terms of a Labour Court recommendation which affected 50,000 workers. The PwC review into the National Children’s Hospital’s costing will look at these ongoing risks and how robust the current forecasts are about the eventual bill. The annual running cost of the hospital will be around €366m during its first year of operation. It is due to open in 2022. The costs are subject to revision in the light of nationally agreed pay increases, non-pay inflation and other external factors arising in the interim, Independent Socialist TD Clare Daly was told. Meanwhile, the new central mental hospital, which is currently under construction in Portrane in north Dublin, and due to be finished this year before opening in 2020, is on budget at €140m. The Department of Public Expenditure estimated the total cost of the project – which will be known as the National Forensic Mental Health Service complex – will be around €178m when additional design team fees, commissioning and equipping costs, enabling works and other finances are added on. The first part of the complex comprises a new 130-bed adult forensic hospital to replace the 94 beds at the outdated building in Dundrum in south Dublin. It will have a 10-bed unit for children.